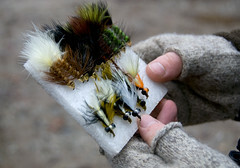 Fly fishing feeds from the best angler resources and blogs. In this a very cool video, witness slow-motion surface attacks on mice flies by giant Brook Trout in Labrador. Over 3 minutes of outstanding destruction and explosive surface takes! This video was captured at Three Rivers Lodge while shooting a future episode of The New Fly Fisher with Tom Rosenbauer.Video provided by www.trophylabrador.comFor some more thoughts about Mousin, check in on the forum. I’m fortunate enough to have a first-run poster from “the movie”, but I’d love to add this one right next to it. Bighorn River is Shaping Up! Not from me, but from the man who made it happen. If you want a copy of the limited-edition book, Single-Handed Fly Casting, you’re in the right place. Get all the details here. Listening to the ARRTI soundtrack. Still swirls up such nostalgia and longing for me after all these years. Days perfected into memories that remain forever despite the endless flow of time. You squeeze in one more trip to the lake--the last trip. You get that last fish--on a muddler. Seasons come and seasons go, and a long season with this lake--ten years--comes to an end. It has been good.So long, lake. Change is hard--and hard work--but you get away to the lake once again. You range a little farther down the familiar shorelines, saying your goodbyes. A trusty muddler brings some fish. Busy times. Big changes afoot. But you can still make time for Trout Lake. The trout are still standoffish, but you fool one with a little caddis. It's windy, then calm. The weather is cool, and the hatches are impressive. But the fish are strangely silent.Saturn, Mars, Antares (top to bottom)You watch the planets align and decide to keep your mouth closed about the fact that you couldn't coax a single fish to open theirs. Today is the Centennial of the creation of the National Park Service. The Adventure Blog shares some of the history and what the NPS is doing to celebrate 100 years of protecting our National Parks. Click the link for more.